Just two races removed from his first career NCWTS win, Lofton will climb back behind the wheel of the same No. 6 College Complete Chevrolet (http://ww.collegecomplete.com, 877-543-2655) Silverado this week for the WinStar World Casino 400k at the Texas Motor Speedway that he drove to victory in Charlotte. Just two races removed from his first career NCWTS win, Lofton will climb back behind the wheel of the same No. 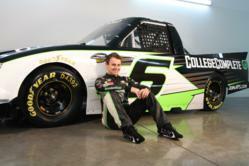 6 College Complete Chevrolet (http://www.collegecomplete.com, 877-543-2655) Silverado this week for the WinStar World Casino 400k at the Texas Motor Speedway that he drove to victory in Charlotte. This week Lofton will be stressing the Free Education Advice provided by his sponsor CollegeComplete.com. Through discussions in Dover last week, Lofton learned about how unemployment rates decrease as education increases. In the most recent Bureau of Labor Statistics employment report, he saw that those without a high school education are at a 13% unemployment rate but that those with at least some college or an associate’s degree see that rate drop to 7.9%. The rate drops to only 3.9% for those with a bachelor’s degree or higher. College Complete has partnered with Lofton to provide free education advice to all and looks forward to hearing from people on their website or by telephone 877-543-2655. You can follow Justin Lofton (@JLracing) and College Complete (@CollegeComplete) on Twitter to get up to the minute information and contest information.